Personal Information: Retired fruit company sales and engineering guy (Apple). Married and have two children. Interests: Family, working out, sailing, gardening, tree trimming, visiting new places in the world. Sporting Background: Casual participant. 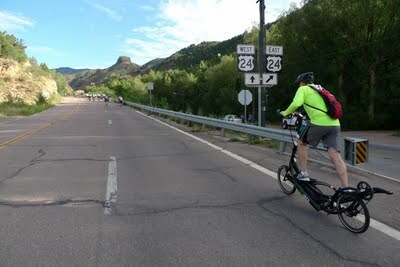 Got interested in the ElliptiGO to get in shape/lose weight – and kept adding challenges from there. Love to ride up and down mountains – and long distances. 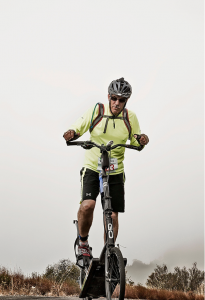 Ride the ‘GO’ because it allows me to workout hard without injury. Like to do randonneuring, metric and full centuries. Have competed in the ElliptiGO World Championships. Why I’m doing PBP 2015: To be part of a team breaking new ground. The personal challenge of time and distance as part of such an historical event. Lastly – to see the sights and sounds of France riding standing up. Something most people don’t know about me: I was the scrawny little kid that others would argue over which team got stuck with in after school sports.